Perfect for the porch where Husband Jim smokes his cigars! dates from that time period. It was painted red and appeared to be the original paint. 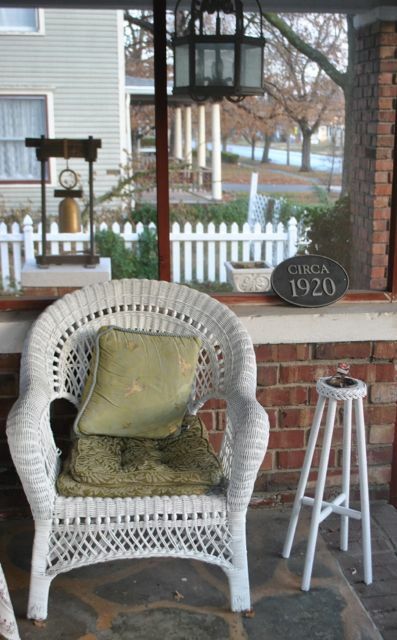 and didn't match the traditional whites and greens of the front porch. And watch the world go by! with matches hand for a relight! Looks good! Great makeover. My mom had many vintage cigarette "stands." I remember then...throughout the HOUSE! Boy times have changed. Lovely little cigarette stand, especially with the fresh coats of paint. My MoMa smoked! It led to her early death @ 78 years of age. I never wanted any of her ashtrays, but I would have loved to have had her crystal (heavy) lighter! Have NO idea where that might have gone!!! Husband Jim should enjoy having this piece close at hand,indeed!!! What a great find! I'm sure that such small items must be rather rare as they'd have had a lot of use. This painted up so nicely! 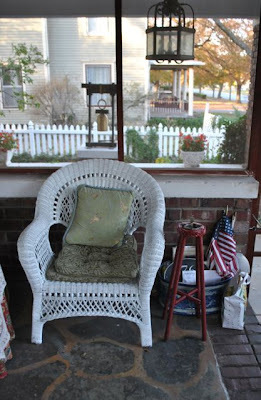 Just righth for your porch. I made your chicken in cream this morning. This is wonderful stuff, and it will be a new favorite! Thanks, Martha.